Police and border officials have busted an Ontario-based human smuggling operation, detaining 30 people. Foreign nationals crossed Canadian border from U.S. at Stanstead, Que. Sources tell CBC News that many or most of the detainees are Roma, an ethnic group whose refugee claims have spiked in recent years. Immigration Minister Jason Kenney says the foreign nationals, all of whom come from one district in Romania, went to Mexico, then crossed the Mexico-U.S. border illegally and drove to Canada, crossing at Stanstead, Que. Kenney spoke to reporters in Stanstead Wednesday. "Unfortunately, there are criminal organizations that from time to time seek to abuse our immigration laws and profit from that abuse," he said. Public Safety Minister Vic Toews designated the border crossings as irregular arrivals, triggering a new provision of the Immigration and Refugee Protection Act that allows detention for irregular or mass arrivals. Under the new provision, those detained get a two-week review, at which point the government will try to determine if they are admissible to Canada as refugee claimants. Prior criminal convictions, for example, would disqualify them. Officials said 85 people have been designated as irregular arrivals, including 35 children who are not subject to mandatory detention under the act. Of the 85, 40 have been located and 30 of them have been detained. Officials are still seeking 45 people. Public Safety officials say no charges have been laid and it's too early to say how many will be charged. The smugglers would offer to get people into Canada, promising them good jobs, according to a government source. But when once they arrive, they find they owe large debts to the smugglers and some allegedly support themselves through thievery, sometimes using distraction operations to steal from people or stores. Most ended up in Toronto, although some moved to Winnipeg, Thunder Bay, Ont., and Montreal, Kenney said. The Romanian nationals arrived from the U.S. on five different dates beginning on Feb. 2. Kenney refused to confirm that the group included any Roma. Kenney has frequently cited the Roma as an example of bogus refugee claimants, because they come from European Union countries — Western democracies, he points out — but seek asylum in Canada. Kenney pointed out that the EU is the No. 1 source of asylum claims to Canada, more than Africa, Asia or Latin America, a situation he said his department finds "peculiar." In the past, Kenney has pointed out that anyone in an EU country (Romania is a member state) is free to live in any other country in the union. Legislation passed last summer gives Kenney the chance to create a designated country list, also referred to as a safe countries list. People from places on the list would see their claims processed faster, with no right of appeal. Kenney has yet to reveal which countries will be placed on that list, but he's expected to make the announcement by the end of the year. Peter Showler, director of the Refugee Forum at he University of Ottawa and a member of the Canadian Association of Refugee Lawyers, says the people detained might be legitimate refugees. "What we are looking at here is people who may very well be valid refugee claimants who will be in jail for more than six months; people who may very well be victims of lt discrimination, if not persecution, and they will have to prove those refugee claims while they are in prison," he said. On Wednesday, interim Liberal Leader Bob Rae said he didn't like the direction the government is going in with these measures. "If you say ... 'There's a group of people [who] have come and we're going to put them in jail and deal with it in a different way,' the problem I've always had with that is it takes away from the notion that each case has to be dealt with as an individual." Rae continued, "The whole key to refugee law to understand is the obligation that we have under international laws, under our own law under the Charter of Rights and Freedoms, the obligation that we have is to treat each case as an individual case and not to simply lump people together as a group." In an email to CBC, Janet Dench of the Canadian Council of Refugees said that the government is creating a two-tier refugee system: "The measures mean that even those found to be refugees (i.e., with a well-founded fear of persecution) are punished for FIVE years (no permanent residence, no family reunification, no right to travel)." Dench also wrote that "basic Charter and international human rights obligations are being violated by this designation. This will be challenged in the courts." 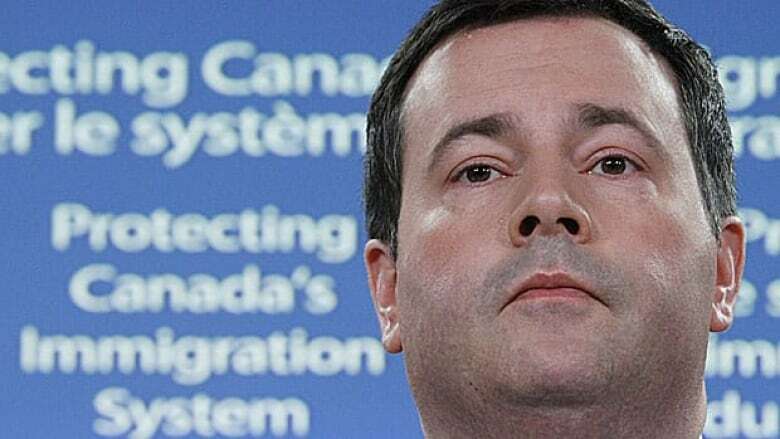 But Kenney made it clear in his news conference that the measures are aimed not just at the "criminal syndicates that profit from human smuggling," but also at the asylum seekers who allow themselves to be smuggled, whether they are genuine refugees or not. Kenney praised claimants who "patiently follow the rules and wait their turn in line." "We are sending a strong message to those who are thinking of using human smugglers to sneak their way into Canada: 'Don't do it, don't even try.' "
An earlier version of this story stated that 85 people had been arrested in the CBSA operation. In fact, 85 people have been designated as "irregular arrivals," 30 have been detained and a further 45 people are being sought, according to officials.